A drawing of von Graffenreid and Lawson under capture by the Tuscurora. This drawing is sometimes attributed to von Graffenreid. On September 20, 1711, explorer and surveyor John Lawson was killed by the Tuscarora. Lawson and Baron Christoph von Graffenried planned to travel up the Neuse River from New Bern in an attempt to explore the area and discover the river’s source. The Tuscarora, angry about incursions into their lands, the kidnapping of their women and children, and disrespectful treatment by traders, stopped the expedition and imprisoned the leaders. Graffenried’s account of the incident stated that Lawson got into an angry exchange with a leader which resulted in the seizure and burning of their hats and wigs, and a sentence of death being pronounced over them. The next morning, Graffenried reportedly chastised Lawson for antagonizing their captors and spoke with an Indian interpreter. After several days, one of the Indians made a plea on Graffenried’s behalf. He was released but kept in a hut, during which time Lawson was executed. It is believed that the Tuscarora thought Graffenried was the governor and that they would incur the wrath of the English if they killed him. Graffenried later heard of several ways in which Lawson was supposedly executed but the actual method of death was uncertain. Cherokee and Choctaw code talkers from World War I at Fort Benning, Ga. Image from the U.S. Army. On July 13, 1767, a public proclamation made official a new boundary line delineating the western frontiers of the province of North Carolina from the Cherokee hunting grounds. The boundary mandated that white settlers west of the line should remove themselves by January 1768, and anyone wishing to trade with the Cherokees was required to obtain a license from the governor. In 1766, John Stuart, superintendent of Indian affairs for the southern colonies, pressed Governor William Tryon to enter into negotiations with the Cherokees regarding extension of the boundary line. Tryon appointed commissioners to conduct the survey and mounted a personal military expedition to take part in the negotiations. The commissioners began their work in June 1767 at the Reedy River in South Carolina. From there, with the assistance of the several Cherokees, they surveyed a line 53 miles north to a tree atop the peak that the Indians called the “great Mountain” and that the commissioners renamed Tryon Mountain. It was agreed that the boundary would extend in a straight line into Virginia, but that that portion would by necessity remain unsurveyed. A 1929 painting of Custer’s Last Stand. Image from Dayton History. Custer’s troopers were quickly encircled by the Native Americans under Chief Sitting Bull, who were expecting them, and Custer and 265 of his men were killed in under an hour. An image of Kanipe from the N.C. Highway Historical Markers Program. Marion native Daniel Kanipe and one other soldier were the only two from Custer’s battalion to survive Little Bighorn. The two were sent to relay messages to Captain Frederick Benteen and others in the train of pack mules supplying the unit. Seeing Custer’s mistake, Benteen held his battalion back and refused to allow the couriers to return to battle. Kanipe remained in the reconstituted 7th Cavalry until receiving his discharge in 1877. He returned to North Carolina where he operated a farm in McDowell County. He went back to the Little Bighorn battlefield in 1908 on a publicity tour to raise money to preserve graves there. Often called upon to relate his experience at Little Bighorn, Kanipe became a celebrity among admirers of the “Old West” and researchers of “Custer’s Last Stand.” His recollections became the basis for many of the 20th century accounts of the battle. 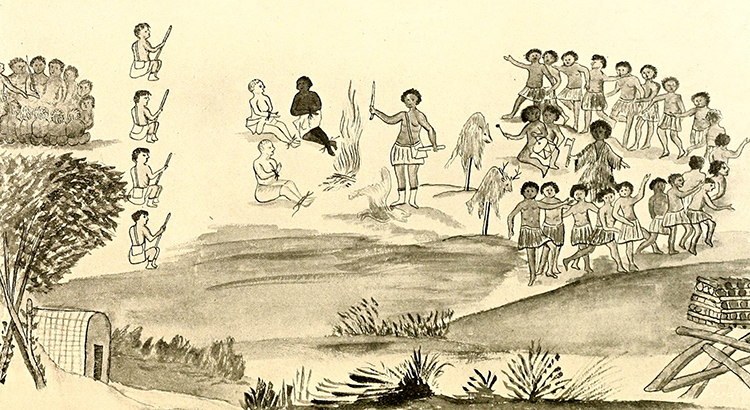 About 300 or 400 Cherokees hid out in North Carolina, laying the foundation for the purchase of the Qualla Boundary property and the establishment of North Carolina’s Cherokee Reservation. Members of the Eastern Band of Cherokee were not formally granted freedom to live in North Carolina until 1866, and the Band was not recognized as a separate entity from the Cherokee living in Oklahoma until 1868. Milas Parker sits behind Judaculla Rock. Parker once owned the property on which the rock sits. Image from the State Archives. On March 27, 2013, Judaculla Rock, a soapstone boulder in Jackson County, was added to the National Register of Historic Places. Though commonly identified simply as a boulder covered with ancient and mysterious engravings, Judaculla Rock is the best-known and largest example of an American Indian petroglyph that can be found in North Carolina. The petroglyphs, or rock art, at Judaculla were carved intermittently within the Late Woodland to Late Mississippian periods from about 500 A.D. to 1700. The rock itself is actually one of several petroglyph boulders within a 15-acre area that is an archaeological site of great significance. A wider view of Judaculla Rock, circa 1935-40. Image from the State Archives. The site is also a landscape component of a prominent Cherokee legend that chronicles the vast supernatural and physical realm of a creature known as Judaculla. Cullohwee, six miles from the rock, is believed to be a shortened and anglicized form of Judaculla-whee, meaning Judaculla’s Place. Today, the Judaculla Rock is managed by Jackson County, which received the property in 1959 as a donation from the Parker family, very conscientious caretakers who still own the surrounding lands. The Eastern Band of the Cherokee is a principal partner in efforts to protect, enhance, and celebrate the site.